Tim Boetsch isn’t the most active when it comes to social media. He darts in and out and makes his posts, but he’s not one of those Tweet-a-minute guys. “The Barbarian” did show up on February 2, though, posting a commemorative ticket from the night ten years earlier when he debuted in the UFC with a stirring first-round finish of David Heath. “I made a post, I think my wife said, ‘Congratulations,’ and that was about the extent of that,” he laughed. Boetsch is exaggerating when it comes to the reaction to the post, but it does illustrate where he stands in the modern MMA game. Go figure, the longtime middleweight contender would be content with showing up, getting a win and going back home rather than figuring out how best to build his brand. It’s all tongue in cheek, but what do you do with a 37-year-old veteran who simply wants to fight, and who does it better than most? Heading into a Saturday showdown with Antonio Carlos Junior, he’s wondering the same thing, laughing as he points out that he had to take a stress test in the lead-up to the bout. If he keeps delivering wins like his most recent one over Johny Hendricks, there will be no holding him back. 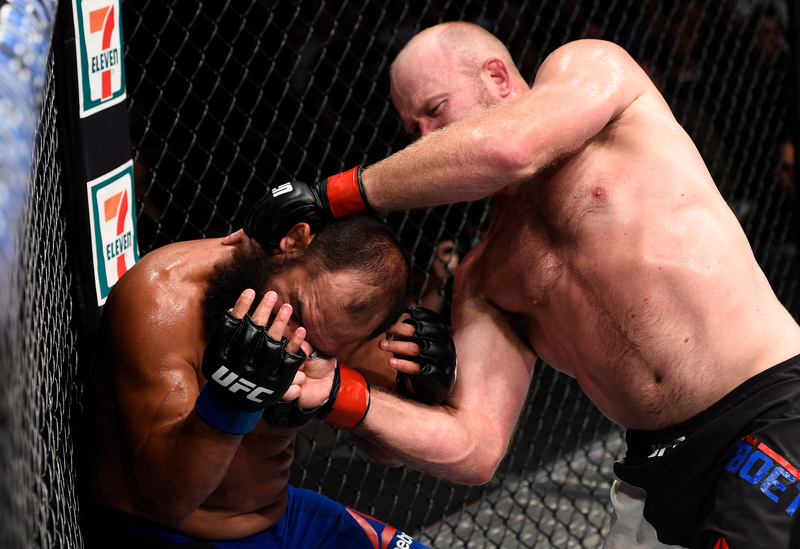 Winner of three of his last four, Boetsch has ended his last four victories over Hendricks, Rafael Natal, Josh Samman and Brad Tavares by knockout. And while he’s had his setbacks along the way, one thing guaranteed is that win or lose, he’s going to deliver a scrap. Putting an end to Carlos Junior’s four-fight winning streak would be a significant accomplishment, especially considering that four of his losses, including a February 2017 defeat to Ronaldo “Jacare” Souza, came via submission. And few are better on the ground than “Cara de Sapato,” a decorated Brazilian Jiu-Jitsu black belt. So to exorcise that demon, Boetsch doesn’t have to learn or hone an encyclopedia of BJJ moves, just enough to get him back to his feet or defend a submission if the fight hits the ground. And hey, if we’re staying on the “old guy” theme, the last man to beat Carlos Junior – Australia’s Dan Kelly – is three years older than Boetsch.